Eid al-Fitr is being celebrated across the globe today. Eid wishes from our favourite celebrities have been pouring in since morning. Eid al-fitr is here. As the air of celebrations and revelry takes over, our tinsel town celebrities are not leaving any chance to make the most of the festivities. On Saturday, Baba Sidiqqui hosted an Eid party which was attended by stars like Sohail Khan, Huma Qureshi, Preity Zinta Sonu Sood, Sooraj Pancholi, and Ileana D'Cruz among others. However, the most sought after attendees continued to be Shah Rukh Khan and Salman Khan, who may have made separate appearances, but were seen having a gala time relishing the traditional snacks on the platter. Eid al-Fitr is being celebrated across the globe today. Eid wishes from our favourite celebrities have been pouring in since morning. Actress par excellence Shabana Azmi took to twitter to wish all her fans Eid Mubarak. Calling the day an official excuse for gluttony, Azmi told everybody to have a feast this festive season with favourites like Biryani and Korma. Actress Alia Bhatt also echoed a similar sentiment as she wished her fans with "love, laughter and lots and lots of food" for the festive occasion. 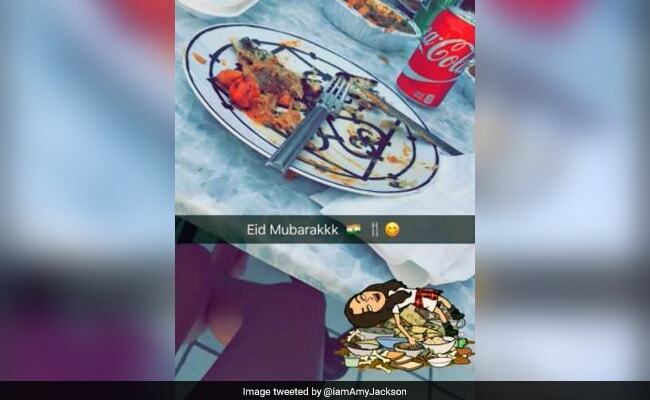 Actress Amy Jackson sent in her Eid wishes from L.A, with a delectable picture of her enjoying a plateful of biryani. Actress Huma Qureshi, who happens to be the daughter of Saleem Qureshi, is a restaurateur who runs a popular chain of restaurant 'Saleem's' in New Delhi, also posted a heart-warming message to her fans, hoping that they find peace,love,safety, good health, and enough food to eat. 'Pink' actress Taapsee Pannu posted that she can't wait for "the celebrations" to roll. Sabbir Khan, director of blockbuster movies like Heropanti and Baaghi also took to the social networking site to convey his good wishes.